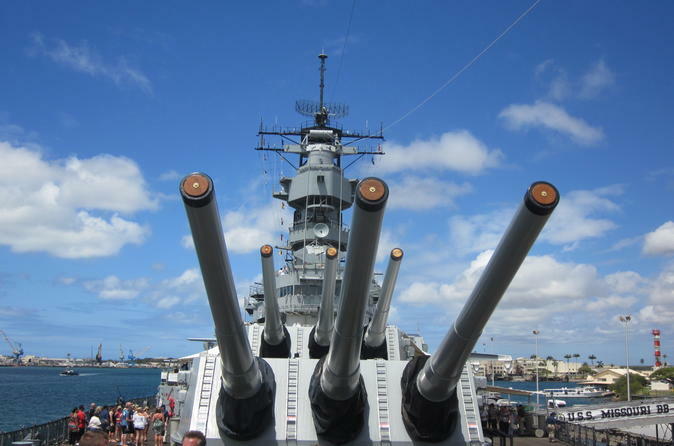 This Premium Tour offers the highest quality Pearl Harbor tour experience. It is designed for guests that desire a premium level of service and the absolute highest standard of tour vehicles of any Hawaii tour operator. IMPORTANT NOTICE: Due to safety issues involving the dock and visitor loading ramp of the USS Arizona Memorial, the Navy has suspended visitors to the memorial for an undetermined period of time while repairs are made. Visitors will receive a tour of Battleship Row, near the USS Arizona Memorial, by boat until further notice. All other amenities within Pearl Harbor remain open. This Premium tour features Pearl Harbor, Punchbowl National Cemetery and downtown Honolulu aboard the finest mini-buses on Oahu. Our brand new Grech vehicles offer the highest level of comfort, visibility and amenities. These luxury mini-buses make touring exceptional – with comforts like USB ports for charging tech, LED interior and exterior lighting to illuminate the way, frame-less passenger windows for unobstructed views and a stunning panoramic front viewing window. Retractable seat belts and smooth air-ride suspension make the ride a true pleasure. Your Premium tour driver anticipates your needs and provides a personal experience that makes this tour a “must-do” for every Hawaii visitor. Each driver shares in-depth, insider knowledge about Hawaii throughout the tour. To augment and enhance your driver’s live narration, a presentation of Oahu’s rich history is projected throughout the mini-coach on state-of-the-art monitors with immersive sound. All inclusive, extra amenities include a slice of local banana bread; picked up by your driver from a local bakery and enjoyed at the start of the tour, an exclusive lanyard with Premium “pass”, full-color souvenir booklet showcasing the tour’s highlights and an official Pearl Harbor tote designed by the National Park Service. Enjoy chilled bottles of Hawaiian water throughout the day. A delicious lunch at a local restaurant is included with a variety of choices to please all palates and a gluten-free/ vegetarian/vegan option. As a guest on our Premium Tour, you’ll enjoy top-notch service in combination with excellent value, transportation on a luxury mini-bus and additional amenities and comforts.